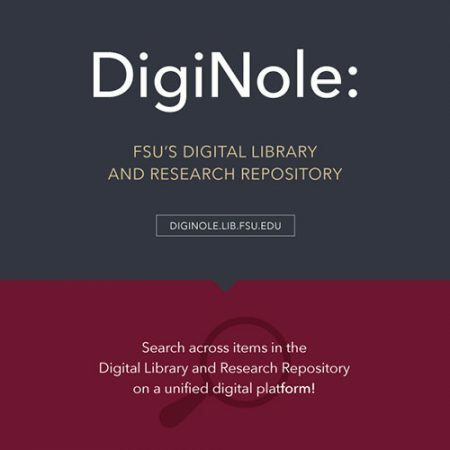 University Libraries are proud to announce the launch of DigiNole, Florida State University’s unified platform for FSU-created and maintained digital resources. DigiNole will enable users’ seamless access to a range of materials through two portals including the Digital Library and the Research Repository. The Research Repository provides a platform for scholars to share the products of their research and creative output. Members of the FSU community are encouraged to submit their work to the repository, which can significantly increase citation impact and public engagement via search engines like Google Scholar. Additionally, authors also receive monthly readership reports with detailed statistics that can be used to help demonstrate the impact of their research. “I have been using the Research Repository for several years. It has made it easier for other researchers and practitioners to access my work,” said Dr. Jim Sampson, Associate Dean for Faculty Development and Professor at FSU’s College of Education. The Florida State University Digital Library provides online access to thousands of unique manuscripts, photographs, rare books, historic maps and other materials from across the FSU campus libraries and beyond. The goal of the digital library is to support active learning and engagement by providing ample opportunities for discovery and scholarship. In order to achieve this goal, librarians are working to constantly add new online resources. “The digital library team is the most important resource on campus for digital humanities projects. When they accepted to collaborate with me on the digitalization of an Italian newspaper, they brought to the table all the technical and management expertise that I needed,” said FSU professor of Italian Studies, Dr. Silvia Valisa. Coinciding with the platform launch will be ‘What’s Past is Pixels: Developing the FSU Digital Library’, a physical exhibit in Strozier Library highlighting the materials hosted in the digital library, the processes for digitization and description, and future uses and collaborations the FSU Digital Library staff hopes to enable. The goal of DigiNole is to serve the FSU community as a single-source hosting and discovery portal. FSU Libraries’ are committed to leveraging the capacity of DigiNole to help FSU scholars achieve their goals. Visit diginole.lib.fsu.edu today to learn more. Florida State University Libraries’ mission is to drive academic excellence and success by fostering engagement through extensive collections, dynamic information resources, transformative collaborations, innovative services, and supportive environments for FSU and the broader scholarly community.